Grease Filters are installed in commercial kitchen canopies above cooking ranges. These filters are designed to remove grease from the air stream before it enters the kitchen extract ducting system helping to minimise fire risk, and make cleaning the extract system more manageable. Airclean manufacture high quality Stainless Steel Baffle Grease Filters for use in commercial kitchen canopies. Baffle Grease Filters are suitable for use new kitchen extract systems canopies and existing systems as replacements. The Baffle Canopy Grease Filter uses interlocking blades which are designed to remove grease and oil from the air stream using the centrifugal forces generated by two 180 degree turns that air takes through the filter. Interlocking blades in this style of kitchen canopy grease filter also act as a flame barrier by restricting the direct path to flames to the duct system behind the filter. 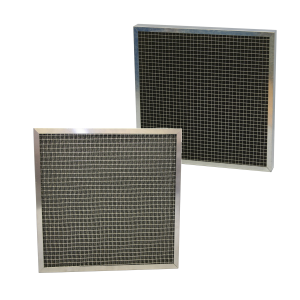 Airclean manufacture Mesh Type Grease filters which can be used as a secondary method of removing grease from a kitchen or industrial environment. 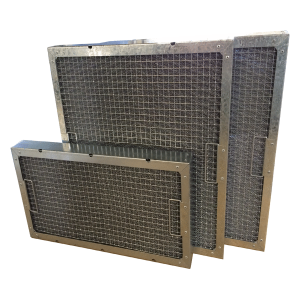 Mesh grease filters are highly effective at removing grease from the air stream in a kitchen extract system and can be repeatedly cleaned to maintain good airflow through the filter. Historically Mesh Grease Filters have been used as primary grease filters in the commercial kitchen canopy, however current standards and guidance suggest that Baffle Grease Filters should be used as they offer a barrier to flames. 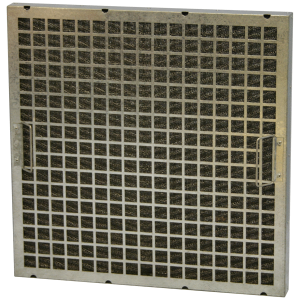 For Stainless Steel Mesh Type Grease Filters Airclean manufacture a Gridmesh Style Grease Filter. 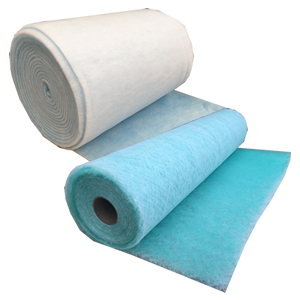 These filters are suitable for the removal of grease, fats and oils from kitchen or industrial extract systems. 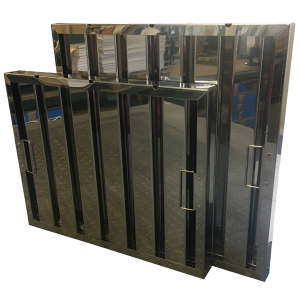 This filter is manufactured from two interlocking sheet steel trays with square punched grids making for a high strength, durable filter. This Mesh Style Grease filters is available with or without handles and drain holes, and can be manufactured in Stainless Steel Grade 430 (mirror finish) or Grade 304 (brushed finish). 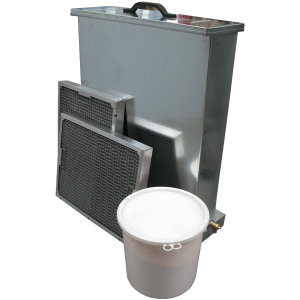 Grease Filter Cleaning tanks manufactured by Airclean can be used to soak, and clean baffle and mesh type grease filters. The cleaning tanks come complete with an industrial tap and hose point so that the contents can be easily drained through a grease trap. Tanks are available in two styles, one with a heater and one without. Airclean’s Series 500 Grease Filter Cleaning Crystals are non caustic cleaning agent and work well at temperatures above 60 degrees centigrade at lifting grease from Mesh and Baffle grease filters. Standard size Mesh and Baffle Grease Filters are available in limited stock quantities. If you require something that is not in stock, or a non standard grease filter these are generally on a 5-7 working day lead time. Grease Filter Cleaning Tanks are available in around 7-10 working days.